The wild and whimsical world of Dr. Seuss – including the Cat in the Hat, the Grinch, Horton, and lots more – are sure to please when you get Dr. Seuss Party Supplies! There are tons of party favors, handy and helpful tableware, and big decorations you can use to create a party no one will easily forget! From Cats in Hats to Whos in Whoville, the varied characters in Dr. Seuss books have been making children smile and giggle since 1937. With a playful rhyme and a heartfelt lesson, each one of Dr. Seuss' 44 children's books has made an impact on generations. Parents and children can both delight in the goofy cartoons and playful verses. 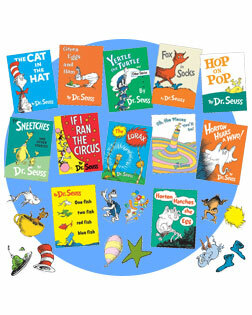 A Dr. Seuss theme is the perfect party starter for kids of all ages and interests. Choose a favorite book or invite a mix of characters to bring the unpredictable nature of endless possibilities to your next big event. No matter what age, no matter what gender, a Dr. Seuss party will be one to remember! One common thread through every Seuss book is a love for creativity. Let their little imaginations run wild with games that require your partygoers to think outside the box. Have kids create their very own characters with craft supplies and invite each guest to share a little story about how the character came to be. You will see things much more farfetched than a simple pup. Oh, the things they will dream up! There are numerous Seuss characters, but the iconic red and white hat from Cat in the Hat is a Dr. Seuss staple. Welcome the guest of honor with a special hat or use tiny sugary hats to cap off personal cupcakes for a Seuss-worthy celebration. The Cat in the Hat was quite the partier after all! Whatever the rhyme or reason for your gathering, there are hundreds of ideas to introduce Seuss characters to your guests. Send your invitations by a plane. Send your invitations by a train. Send your invitations to their house. Send your invitations through a mouse! 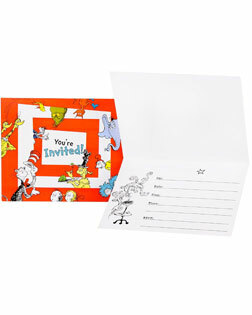 However you choose to deliver your playful party invitations is up to you, just make sure your cards are Seuss-style true. To host the most stylish Seuss party that your mind can imagine, you will need a plethora of wild decorations. You can transform any space into a whole new world with the right decor and a little creativity. Brilliant colors and playful props can be used throughout the space for the perfect birthday-party theme. Think of whacky piñatas and bouncing balloons to bring a whole to dimension to the room. And will you succeed? Yes! You will, indeed! 98 and 3/4 percent guaranteed. Go up, up and away with your theme by adding a few balloon bouquets for a fun centerpiece. The sky is the limit when it comes to creating the perfect party, and these bold colors and designs will help you get there. All of the Dr. Seuss characters gather together to wish the birthday boy or girl the most magical day. Customize the banner to say your little one's name and make him or her feel truly special for the day. You would, you could eat green eggs and ham with themed place settings, Sam I am. Complete with plates, cups, napkins and plastic ware, you will have everything you need to host a fantastic feast. Kids will love the colorful table almost as much as they anticipate cutting in to the cake. Get creative with the menu and create fun-filled dishes that encourage kids to break convention and play with their food. Don’t worry, there are plenty of Seuss napkins to clean off any sticky fingers. As Dr. Seuss says, "fun is good!" Start the party with fun activities and wind it down with more fun activities. Fun never gets old! Whether the partygoers are 4 or 10, they will all love to get creative with crafts and pump up the excitement with friendly competition. You can put a Seuss spin on old favorites like pin the tail on the Lorax or build a fort worthy of the Grinch. You could even break out The Cats Quizzer for a mixture of picture puzzles, logic tricks and silly questions. The Cat in the Hat piñata will be a surefire hit! Take a swing to find the treasures that hide inside the colorful casing. From candy to toys and little surprises, you just never know what might pop out of the hat! Send guests home with more than just party favors. You can provide wonderful keepsakes of their magical time. Photo Booth Props will encourage kids to gather together to take goofy pictures with their friends, and they will cherish the memories they will create. What genuine smiles you will see! The guest of honor should always stand out, so why not have a little fun with it? A child-sized Cat in the Hat costume is perfect for your boy or girl. Just slip on this Seusserific costume for hours of imaginative fun. Anything is possible when the imagination takes hold! No one will leave empty-handed when your guests have plenty of party favors to choose from. Big and small, few and many, these party favors will entertain you plenty! Wrap your favors up neatly in a stylish box when it is time to leave, or keep it a secret so guests will be filled with delight when they open their surprise box when they get home at the end of the day. Instead of serving one large cake, give guests their own personal cupcake in a colorful character wrapper. Either decorate the cupcakes with elaborate creations or let guests create their own. Don't fret trying to fill your favor boxes. These boxes are magically filled with stickers, drawing supplies, bouncy balls, lollipops and more! These effortless boxes are already prepped with crowd favorites. Everything is better with a personal touch. Dr. Seuss knew just how to connect with the hearts of his readers and you know how to connect with your special one on his or her special day. It doesn't take a lot of extra time to personalize your party supplies, but the reward will be worth it. Whether it is a banner, hat or place setting, using the birthday boy's or birthday girl's name, age or even photo for all to see will simply fill them with delight. Greet guests with a big, bold banner. There won't be a doubt in their mind that they are in the right place, and they will be put in the party mood right when they walk through the door. With a personalized touch, the guest of honor will feel like a star. Make cake time extra special with personalized plates. As they anticipate the sugary goodness and try to guess what flavor they will receive, guests will get a kick out of your custom message. Adding a special image or a special message to your party with personalized plates is just icing on the cake! A party isn't a party without all your wonderful friends, so make sure to thank them for staying till the end! The wonderful memories you created and the amazing time you had deserve to be recognized. Be sure to thank each and every one of your guests for sharing such a fun experience with you. Take the extra time to write out a heartfelt "thank-you" note to each guest on Dr. Seuss cards that fit your theme. Before even opening their plentiful party favors, guests will be reminded of the amazing time they had at your Dr. Seuss themed party. Customize the image or customize the text to excite guests for what is to come next!